I just caught this image in a Facebook post by Will Richardson and it made me return here to record and share a few thoughts. It begs questions relating to relevance. It also begs for discussion about meeting kids where they are. It also makes me reflect on the theme of a rather powerful meeting this morning regarding “culture.” Is the culture we seek to create in school… from scratch and of our own doing? Or are these questions also an element of the debate? How can we also credit the culture being created today, and not only bring students into the fold of our vision, but also join them in new places to co-create a culture of learning for the future? From where I sit, it is no longer a question of if we should. It hasn’t been. A few are already embracing these channels for good, and have been for some time. In my reality of classrooms soaked in the ubiquity of personal computing, I could easily be misled into thinking this is already the norm in many places. I’ve seen some pretty wise examples of this firsthand with teachers I work with. Yet, the reality is: the sort of smart, purposeful embrace of new media for learning I’m talking about is still existing only in pockets. And yet, I think that if we aren’t yet at least asking these tough questions, we’re behind. Television captured attention in its day. Digital gaming was perhaps the next cultural crack to vie for the attention of youth. Today it is the web. Each of these entities was potentially more all-consuming than the previous… or potentially liberating. 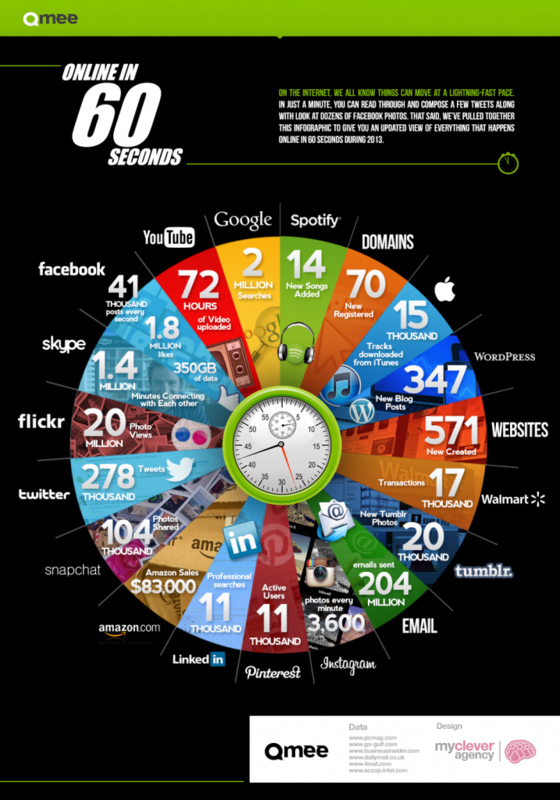 Yes, much of what is in this graphic is still little more than noise. That says little of the potential here. I believe it to be your mindset that largely frames the issue. Do I think life and learning does or should exist solely in a virtual world? No. Not even close. Trolling back through the hundreds of posts here will show this to be true. I have been a life sciences teacher for 21 years. I have been a parent for the past six. I want all children to learn by touching, smelling and interacting with the real world. I want them to learn deeply and rather slowly at times. I also want to credit the modern world that currently engulfs us. I want smart teachers leading the way. I want balance in these things. I have long been of the opinion that playing “defense” and plugging away on a path that doesn’t credit modern communication channels is just, well… nearly malpractice. Truly embracing these changes might be down the path for you and your organization, but that doesn’t mean you cannot engage in these tough questions as you strive to build a nimble and complete learning environment for the young people you serve. *Will Richardson, who has pushed my thinking for well over half a decade. *Dr. White’s Leadership Team address today that heavily featured the topic of school culture. *My wife, Erin (pictured above) for being that kind of Mom to our girls. I’m on a team of educators that’s trying to bring Discovery Learning to students through digital apps. We think we’re a couple years away from digitally realizing Dewey’s dream for education (though he’d be cranky about the tech component). We’d love for you to give us feedback on our current project, and it’s right up your alley: A virtual field trip to Polar Bear Country, heavy on science, games, and simulations. The two leaders of this project are (1) one of the guys who made MYST (1993), and (2) a design director from Highlights Magazine.